* December 28th, 1944. † July 9th, 2017. Arnold Picot passed away unexpectedly on July 9th 2017. An emeritus of the Ludwig-Maximilians-University of Munich Arnold Picot was one of the initiators and founders and member of the board of Directors of the Center for Digital Technology & Management. As a professor of Business Administration he held a chair at the Munich School of Management (LMU) and the head of the Research Center for Information, Organization and Management.After studying Business Administration and Economics. He obtained his two Doctor’s degrees in 1972 and 1975 at the University of Munich. 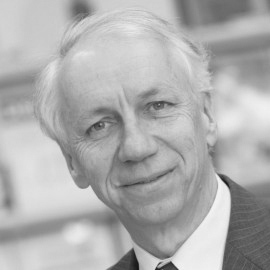 Before Prof. Picot joined the LMU in 1988, he was a professor at the University of Hanover, at Stanford University, and at the Technische Universität, Munich. In 1998, he obtained a Doctor Honoris Causa from theTechnische Universität/Bergakademie Freiberg, and another one in 2002 from the University of St. Gallen, Switzerland. He was the Konrad Adenauer Visiting Professor at the School of Foreign Service, Georgetown University, Washington D.C. He has held and is holding various positions in boards and advisory committees of research institutions, among them the German Research Foundation (DFG), the Bavarian State Ministry of Sciences, Research and the Arts, the German Federal Ministry for Education and Research, the German Federal Ministry for Economics and Technology, the Federal Network Agency (Bundesnetzagentur) and Fraunhofer-Gesellschaft. Arnold Picot’s efforts have been fundamental for the development of CDTM. His vision, optimism, organizational skills and capacities as a teacher, advisor, mentor and human being have inspired everybody at CDTM and promoted the development of CDTM since end of the 90s, when CDTM was a “university start-up”. Arnold Picot won the respect and gratitude of colleagues and students alike. In recognition of his achievements and his personal warmth as a human being, we will always hold him in grateful memory. Obituaries in Süddeutsche Zeitung and Frankfurter Allgemeinen Zeitung.